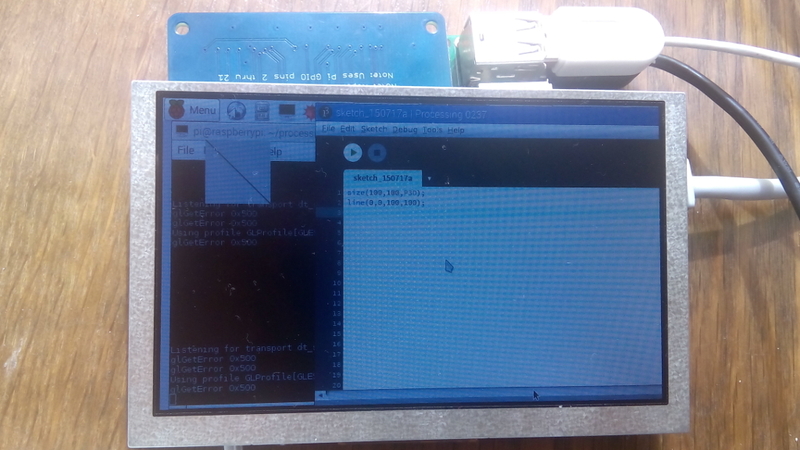 Processing 3 is running for the first time on a Raspberry Pi using Eric Anholt's Mesa3D VC4 driver! Thanks to the free software Mesa3d vc4 driver, the raspberry pi suddenly turned from a mobile opengl es 2 system into a "desktop" opengl 2 system. Getting Eric Anholt's Mesa3D VC4 driver running on a Raspberry Pi is easily done thanks to the work by gohai. When using Eric Anholt's Mesa3D vc4 driver then EGL will expect a Unix X11 Window for its EGLNativeWindowType and this is why processing will work out of the box when Erics Mesa3D vc4 driver in use. Eric's vc4 driver also implements OpenGL 2 that can be initialized using GLX. GLX allows you to run Processing with OpenGL acceleration across remote X11 network connections! "symbol lookup error: ../path/to/processing_sketch/libnewt.so: undefined symbol: bcm_host_init"
george.profenza wrote: That's great news! Sounds like your system image still contains the /opt/vc directory. it is possible that the /opt/vc/lib folder have for some reason re-appeared by running a system update. and try initialize opengl es 2 using the broadcom specific bcm_host_init() initialization API, this API will fail if you are on a system using Eric Anholt's new Mesa3d vc4 driver. 10. press run to run it! Moving /opt/vc did the trick! I did use 20150710-1502-vc4-image, but Processing 3 wasn't pre-installed. Is it normal for this to run slow ? With the LowLevelGL example I get about 8-9 fps on average. When triangle is titled (less surface visible) the fps go up. Reducing the sketch size to 320,240 also improves it. but the faces look correctly depth sorted. Do I need to configure the pi to allow maximum video memory ? Any suggestions on how to improve framerates ? george.profenza wrote: Is it normal for this to run slow ? you are due to some unknown reason using mesa3d with software emulation. there is two ways to improve frame-rate both require enable of hardware acceleration. if GL_RENDERER is Gallium 0.4 on VC4 then you are using the new vc4 driver! We plan to have the fix merged into the JogAmp JOGL 2.3.2 release. With the fix applied makes it possible to use Processing 3 in combination with the properitary Broadcom OpenGL ES 2 driver. I am collaborating with Gottfried Haider to merge all changes required to processing that made it work. The future Processing 3 release will thus work out of the box on all raspberry pi systems. I was wondering if this driver can be used for a Rpi B+ Rpi 2 Jessie based Mate desktop system. For general HW Accelerated graphics on applications such as OpenCPN? Hi I tried downloading the image file and burning to a sdcard. I used 2 different sdcards both known good. There are errors on the image that stop booting. Maybe something is amiss with the build. Tried the last 3 days images. I'm running into the same issue as Sparticle. The images for 20150801 and 20150718 both do not work. As sparticle mentioned, they do not load on the RPi. I'm downloading another image (20150704), and hopefully this one will work. sparticle wrote: Hi, I was wondering if this driver can be used for a Rpi B+ Rpi 2 Jessie based Mate desktop system. For general HW Accelerated graphics on applications such as OpenCPN? Yes, the Mesa3D OpenGL 2 vc4 driver will work with any opengl application. for example i tested using the driver to "run" the full version of minecraft that require OpenGL 2.
sparticle wrote: Hi I tried downloading the image file and burning to a sdcard. I used 2 different sdcards both known good. There are errors on the image that stop booting. Maybe something is amiss with the build. pkshah wrote: I'm running into the same issue as Sparticle. I do not know why the image fails on your boards, because I tested to download the 20150801 image and it runs on my pi's. Maybe your hdmi monitor is not yet supported by the new vc4 modesetting driver? I have had issues getting a screen using a odroid-vu screen while hdmi works fine whan attached to a philips 190x screen. Please describe the commands or tools you used to write the image. remember to unpack the image before you write it to the sd-card. when https://processing.org/ announce that their next processing 3 beta include ARM support then you know it is ready. Sweet! So does it only support OpenGL 2 or can my game http://aeonalpha.com that uses OpenGL 1 mostly (I use shaders for VR barrel and chromatic aberration) run on this. Is it hard to port this to LWJGL or do I need to switch to JOGL? BTW if this can run old OpenGL I'm going to build a Pi VR headset at some point, maybe RPi 3 if it's powerful enough! bullen wrote: Sweet! So does it only support OpenGL 2 or can my game http://aeonalpha.com that uses OpenGL 1 mostly (I use shaders for VR barrel and chromatic aberration) run on this. Using OpenGL 1 is also supported by the new vc4 mesa3d driver. bullen wrote: Is it hard to port this to LWJGL or do I need to switch to JOGL? you also need to recompile openal, jinput and possibly jrift. Ok, this is very cool! Good job! The LWJGL guys are busy, but if someone can lend them some help that would be awesome since OpenAL and joystick support are good to have in VR! If the LWJGL guys somehow get this up and running and my game runs at some kind of framerate on RPi 2 I will build a RPi VR head mount (wearality lenses, RPi 3?! compute module, custom IMU and Rift/Vive screens!) and open source my game engine! Last edited by bullen on Sun Aug 23, 2015 2:22 pm, edited 1 time in total. Just to complete the picture, the Rift or Vive are never going to run on a raspberry pi. They have closed source hardware drivers. bullen wrote: Just to complete the picture, the Rift or Vive are never going to run on a raspberry pi. They have closed source hardware drivers. the rift is a generic HID "raw" device thus it should work on the pi. however, the rift need two high speed usb ports, one for the camera and one for the display and here we may run into issues. please start a new thread how to port your game to the pi, continuing on this thread is all off topic. Interesting... When I used the images off the daily update site, the first one works great, but the second one boots to a curser on black screen. I can ssh and vnc into it and it's running, but doesn't recognize my hdmi/DVI cable like the first image. I opened the display properties over VPN and it can't recognize the display through the cable. Not the cable. I plugged it directly into the TV set with HDMI , restarted, and still arrow and black screen. Hey I'm happy to have 1 image that has hardware acceleration working. I'm getting about 59 fps windowed, 13 fps full screen on glxgears. I'm hoping to get this to work with Opencpn. Anybody else have any stats. akopac wrote: Interesting... When I used the images off the daily update site, the first one works great, but the second one boots to a curser on black screen. I can ssh and vnc into it and it's running, but doesn't recognize my hdmi/DVI cable like the first image. I opened the display properties over VPN and it can't recognize the display through the cable. Not the cable. I plugged it directly into the TV set with HDMI , restarted, and still arrow and black screen. Thank you for testing the current state of Eric Anholts new Linux kernel, xorg and Mesa3D by trying out the images. Many parts of graphics initialization that before was done by the closed source firmware is now handled by the kernel. One important step is that all the "clocks" that are required to provide timings used to output the display must be done by the new kernel driver. Eric Anholt is currently working on improving the graphics clock initialization, i expect your TV to work when Eric's latest "clock" work is built into a new system image. I'm try latest image and i see that perfomance very very slow - boot need many many time. Why? kernel 4 ? Yes the system image is using an uptodate kernel and we have enabled quite a lot of debugging in order to be able to fix issues that we encounter. When we develop and test then we must reduce speed in order to have better debugging . If you are simply interested in running processing 3 than i have good news for you. You can use the latest processing file 20150821-1625-vc4-processing.tar.bz2 on a regular Raspbian system in combination with the default Broadcom /opt/vc VideocodeIV GPU OpenGL ES 2 driver. This will be fast. Try this from a terminal window on a regular "noobs" installed Rasbian system after running startx. The reason why this work is that the latest processing 3 beta 4 and later includes improved OpenGL ES 2 support and uses the latest JogAmp JOGL that can take input from X11 while it render to a DispmanX overlay, this makes the default driver on the Raspberry Pi work for most examples out of the box. Yes, if you use a "default" system with the Broadcom OpenGL ES drivers then getting system updates will work without issues. I think you should start a new thread about OpenCPN and we can check how to best make it work on the Pi. It is off topic for the Java forum and this Processing 3 thread. I also think that you can get OpenCPN working with the new Mesa3D OpenGL driver by running gohai's buildbot buildscript on a Jessie system and use it to patch a Jessie system image. However this will take a bit of time to do but may serve as a challenge if you are interested in running a free software GPU driver on your Pi. But i'm think this not true. how to test the driver if he slows down the system? In the first phase we are interested in testing stability of the driver, thus if everything work without crashes or rendering issues == great success. The driver is already way faster compared to using Mesa3D software rendering. The driver allow OpenGL 2 applications to run faster. However we do compile the driver with debugging information compiled in and this will reduce speed a little but the bonus is that we get useful debug information when we attach a debugger. The driver can be speed up by tweaking compile options to remove debug information and optimize for speed. Myself i can for example get Minetest and Minecraft running with improved framerates using the new OpenGL 2 driver something that was not possible to do with the OpenGL ES 2 driver. sekil wrote: Current system not usable. If you are only interested in running OpenGL ES 2 applications then continue use the default OpenGL ES 2 driver shipped with Raspbian. If you are interested in running OpenGL 2 applications then do continue to test the new driver.